Leaflet Distribution Bedworth — Get A Professional GPS Tracked Leaflet Delivery Service For Your Bedworth Leaflet Distribution Campaign From DEFENDA Leaflet Distribution. When you need to generate sales and new business in the Bedworth area, leaflet delivery is an important tool — it’s an incredibly cost effective way of delivering your message directly to homes in the area North of Coventry. Why are customers choosing Defenda Leaflet Distribution for Bedworth campaigns? Leaflet delivery is undoubtedly an extremely successful means of generating sales or raising awareness of products or services within a set area. Choosing the right partner for your Bedworth leaflet delivery is even more crucial in ensuring this extremely useful marketing approach is conducted properly (sadly it is not uncommon for unscrupulous companies to receive payment & then fail to deliver). We are the areas oldest established leaflet distributor and its most respected. We were the first to provide clients with real-time GPS Tracking so they could be sure that their campaign was being managed professionally. You can therefore be sure that with us, your direct marketing campaign will be in extremely safe hands & deliver the best results for our clients. Our Leaflet Distribution Bedworth Service Includes Free Demographic Data & Mapping of Bedworth for Improved Targeting. We can provide a huge amount of data on the area enabling accurate profiling of your potential target market. Mapping part or all of Bedworth is easily performed to give accurate household counts and improve your print buying. Many clients choose to combine Bedworth with Nuneaton, Brinklow & Exhall for their leaflet delivery campaigns. Prior to your Bedworth Leaflet Delivery Campaign starting, we will provide you with login details so you can monitor your leaflet distribution’s progress in real-time. This can be done on your PC or even your mobile phone and allows you to track our distributors to their exact location should you wish to check physically that we are delivering as agreed. We know that timings & deadlines can be crucial to the success of a leaflet distribution campaign. We therefore don’t use potentially unreliable students or ad hoc distributors. Our distribution staff are full-time & adults — meaning your campaign timings are not bound by when a casual distributor can fit you in. 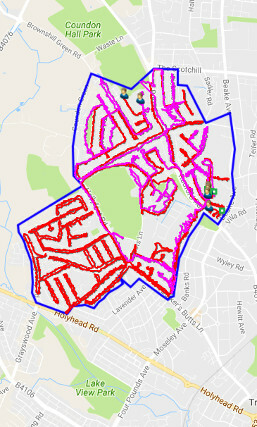 GPS Tracked Bedworth Leaflet Distribution is available as a solus service (your leaflet only) or as part of a shared leaflet delivery option.